After a sharp pullback in sales and average prices in the wake of Ontario moving to cool the market, realtors were counting on the so-called back-to-school buyer to emerge and set the tone for the fall. September’s sale volumes, up to the 27th of the month, plunged between 38 to 45 per cent depending on home and location, according to Zoocasa’s data. And as buyers and sellers try to navigate a cooled market, expectations may not be entirely realistic. Adding to the mix, Canada’s banking regulator is planning yet another round of mortgage tightening. “Toronto is especially vulnerable to Ottawa’s next round of tightening,” Rob McLister, founder of RateSpy.com, said in an email to BNN. 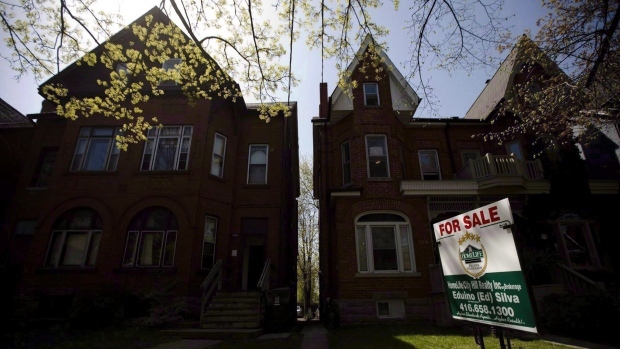 The Office of the Superintendent of Financial Institutions, Canada’s banking regulator, is taking aim at the uninsured mortgage market, where homeowners make a down payment of 20 per cent or more. It’s proposing stringent stress tests for those borrowers, in line with what’s already happening in the insured market. As a result, those conventional buyers could see their purchasing power slashed by 18 per cent. Despite looming challenges, the City of Toronto is managing to rebound faster than the surrounding municipalities in the GTA, according to John Pasalis of Realosophy.com. And while sales remain under pressure across the region, an anticipated surge in new listings also failed to emerge in September. “If new listings surged as sales were falling, this might have put more downward pressure on house prices,” said Pasalis, who expects average prices to rise three per cent year-over-year in September – led by the condo market. Overall, Pasalis says it’s a much healthier market. “Last year there was so much demand that house prices were appreciating at a rate of 20 per cent year-over-year,” he said in an email to BNN.